A Celebration of Life for Mrs. Jane "Gail" Jackson, 86 of Decatur, AL. will be noon Monday, January 21, 2019 at St. James C.P. Church in America with the Reverend Michael Jones officiating and the Reverend Dr. G Lynn Herring eulogist. Inhumation will follow in Sterrs Cemetery. The body will lie in repose one hour prior to funeral. Public viewing wll be Saturday and Sunday from 2-6 at Reynolds Funeral Home. Ms. Jane “Gal” Jackson was born in Decatur, Alabama on April 13, 1932 to Ed and Ora Bell Jackson. 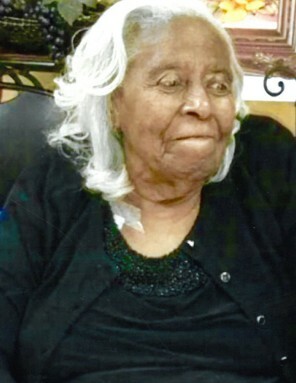 After the passing of her parents, Gal and her siblings were reared by their grandmother, Minervia “Grandma Ninny” Dowdell. She departed this life on Wednesday, January 16, 2019, at Decatur Morgan Hospital-Decatur General Campus. Sister Jackson accepted Christ at an early age and joined St. James C. P. Church, by the river and was a member of Choir #1. Gal, as she was affectionately called by her family and friends, loved cooking for her family and friends in the neighborhood. She had many fish fries for the building of the former church on 11th Avenue, N.W. Gal loved people. She would enjoy laughing and talking to people. She never met a stranger and would help anyone that she could. She was blessed to have lived to see five generations. She was preceded in death by her parents; one daughter, Patricia Ann Jackson; eight brothers, Flenoy Jackson, James Jackson (Jane’s twin), Jervis Jackson, Sr., Clifford Jackson, William Jackson, Sr., J D. Jackson, Clarence Jackson, Sr., and Billy Joe Jackson; three sisters, Mrs. Lucille Mitchell, Mrs. Lois Garth, and Mrs. Elsie Stone. She leaves to cherish her memory: three daughters, Gloria Jackson of Decatur, Leisha (Julius) Brown of Birmingham, AL and Kimberly (Dennis) Milan of Decatur; three sons, Charles (Loretta) Jackson, Anthony Jackson, and Christopher Jackson; 11 grandchildren; 10 great grandchildren; two great-great grandchildren; and a host of nieces, nephews, cousins and friends. Pallbearers will be Nephews and Flower Bearers will be Nieces.